Welcome to Greenland Bio Science. Manufacturer & Supplier of Agricultural Fertilizers and Pesticides. The company was incepted in 2008, at Vadodara. Our Client centric organization and State-of-the-art infrastructure make us different from others. International quality standards and variegated payment options help us to serve Clientele like Pooja Biyaran and Ashwani Enterprises. Liquid Nutrient and Nitrobenzene Bio Fertilizers are some of our products. 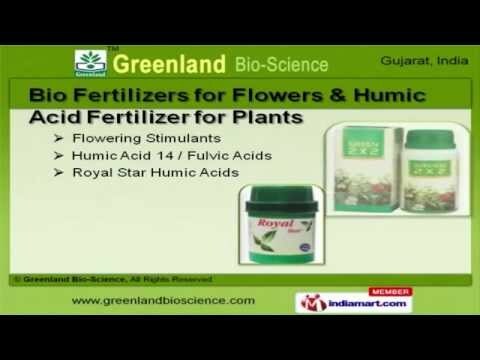 Our Bio Fertilizers for Flowers and Humic Acid Fertilizer for Plants are extremely reliable. We are a leading firm engaged in offering Bio Pesticides for Chilli Crops and Pesticides for Lava Protection. We are specialized in offering Liquid Nutrient & Nitrobenzene Bio Fertilizers. Along with that we offer Bio Pesticides for Cotton Crops and Fungicides for Fungal Infection. We also provide Growth Regulators for Horticulture and Bio Pesticides that are best in the industry amongst others.